The Place It has just been lobster rolls for many years, and finally there is another type of crustacean to look forward to at Pince & Pints Duxton Road, crabs! Opened since 2014, the Duxton Road outlet is where the brand started, before opening its second outlet in Katong and even boasting an outlet in Kuala Lumpur. It is not an easy feat for a restaurant to be around for five years and more in a competitive F&B market like Singapore. The Food Using whole live Sri Lankan Mud Crabs, the newly launched crab dishes are exclusive to the Duxton outlet, whipped up in various flavours. For a start, I tried the Korean inspired Crispy Soy Chicken Wings (S$12), one of the new starters on the menu which is good for sharing. It comes in about six pieces of drumlets and wings, which has a nice crispy texture and sweetness in flavour. It is also slightly spicy for that added oomph. On to the crabs, the Whole Grilled Crab (S$55) is my favourite of the lot. 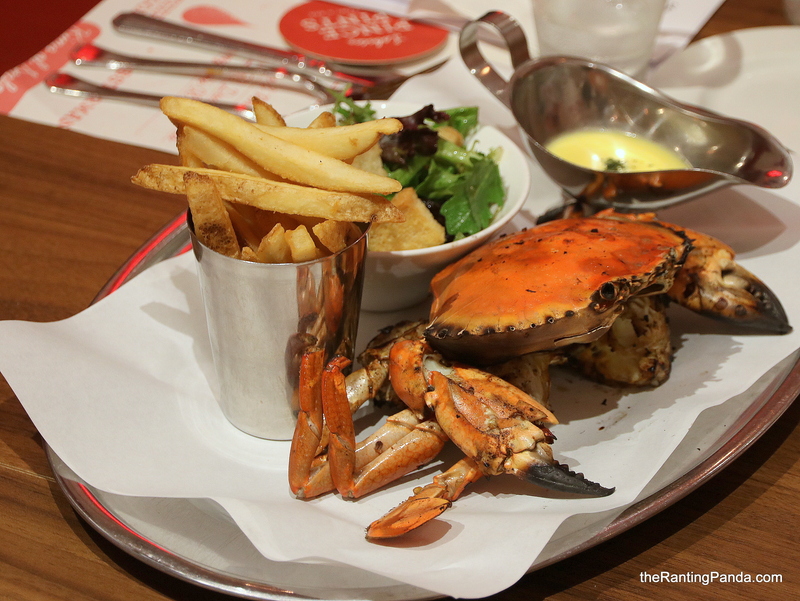 Served with salad and fries with butter sauce, it is not uncommon to find grilled crab in Singapore. There is some burnt spots at the edges of the crab, where I could literally smell the charred texture. The crab meat is naturally sweet and fresh too. Next up is the Whole Steamed Crab in Egg White (S$55), which is served with jasmine rice. This is definitely a more oriental take of crab, especially when the egg white and accompanying sauce is mildly soaked with Chinese Shaoxing Wine. With that, you get that nice aroma of the wine on the fresh crab meat. Although we do recommend them to be more generous with the Shaoxing Wine to give it more of a punch. If you fancy something more locally inspired, the Whole Chilli Crab (S$58) wouldn’t go very wrong. The crab here is cooked in chilli gravy, which really isn’t spicy at all. Choose from mantou or jasmine rice to go along with this dish, although I highly recommend getting the fried mantou which is obligatory to go with the chilli crab sauce. The last crab dish I had was the Crabmeat Fried Rice (S$18), which is fried with eggs and served with homemade chilli oil. There is a nice ‘wok hei’ to this plate of simple looking fried rice, which comes with generous chunks of crab meat. Crab aside, it is also good to try one of the lobster rolls here, which is really what Pince & Pints is about right from the beginning. Go for the locally inspired Nonya Chilli Lobster Roll (S$58), which I feel is an interesting take as compared to the classic roll. The Nonya chilli adds a delicious tinge of spiciness to the roll, which is served with salad and fries along with garlic butter sauce. Rants Prices are no doubt on the high end at Pince & Pints. Will I Return Again? It’s interesting to note if there would be a fresh comeback for lobster rolls with the impending opening of the first Burger & Lobster outlet in Singapore at Jewel Changi Airport. It is timely for Pince & Pints to refresh its menu at this time by introducing new crab dishes. Crab and lobsters at the same time, why not?